Multiple forces seem to be conspiring against the diamond industry these days, and if mining stocks are any indication, the wider market takes a pessimistic view of its prospects. But as independent analyst Paul Zimnisky explains in his latest analysis, "Don’t Give Up on the Diamond Industry Just Yet", to take this attitude as a foregone conclusion is to underestimate the resilience of the industry as a whole and overlook not only the enduring intangible value of diamonds, but also the impact of what may well become their much more tangible rarity. 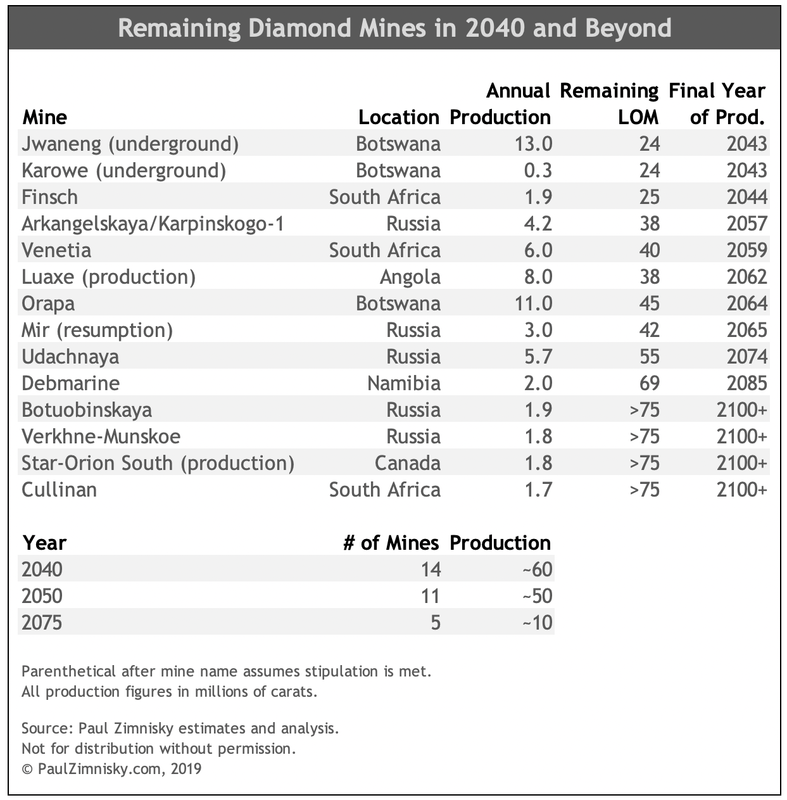 Republished in full from Paul Zimnisky's Diamond Analytics with the analyst's generous permission, we present his in-depth look at the present and future of the diamond industry. If diamond miner equities are a proxy, the sentiment surrounding the diamond industry is currently at historic low levels [See Figure 1]. 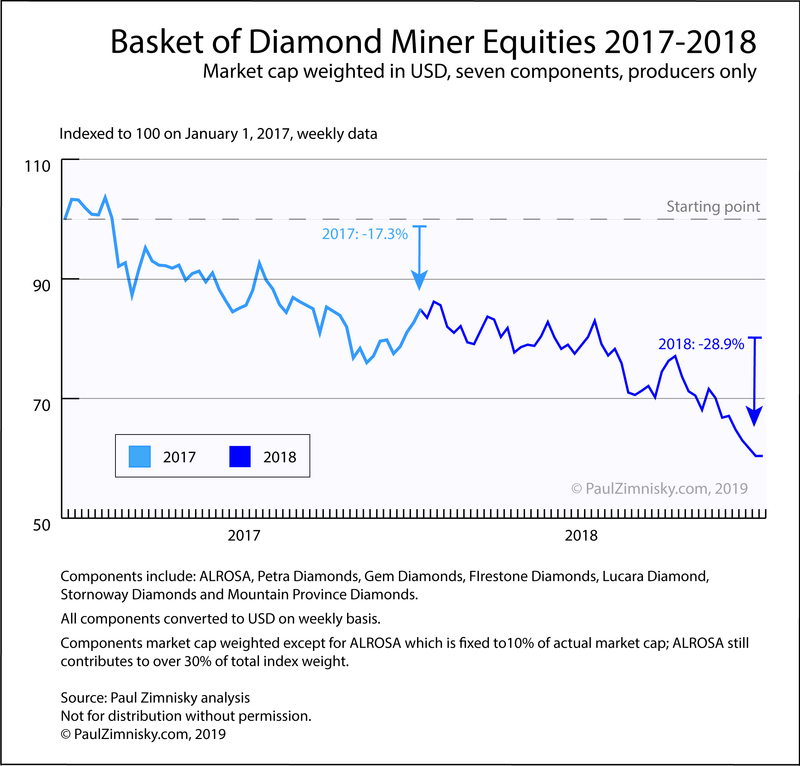 Just in the last two years, a basket of diamond producer stocks was down 28.9% in 2018, following a decline of 17.3% in 2017 (see Figure 1). This is in part due to idiosyncratic operational challenges that most all of the miners are dealing with in one way or another, however, investor sentiment is also undeniably low by valuation standards projected by future diamond price expectations. This has led to concerns spanning the industry’s future growth prospects and overall longer-term economic viability. In addition, despite the fact that marriage rates are declining, diamond consumption by self-purchasing women in on the rise and younger generations in the U.S. are still buying diamonds despite a narrative that the generation is too indebted to afford luxury. 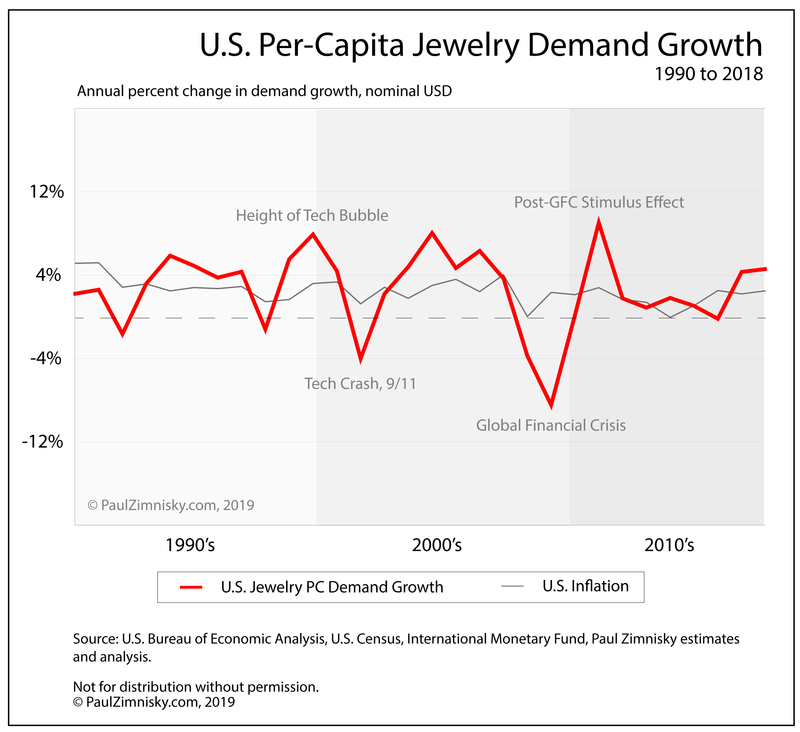 In fact, per-capita jewelry demand growth in the U.S., the diamond industry’s largest end-consumer market at approximately 50%, has been non-negative since 2010, which normalizes for population growth --technically, without rounding, there was negative growth in 2016 of 0.19% [see Figure 2]. However, diamond jewelry is different from industrial-diamond because it is a purchase based on how it makes someone feel. There is significant emotional appeal if diamond jewelry is conveyed properly, and the story behind a natural diamond specifically can be very compelling in that context. Further, narrowing in on the concept of a diamond’s marginal utility(1) and principles that are hard-wired into humans such as Zahavian signaling(2), can also continue to be leveraged by the diamond industry to drive demand as it has in decades prior. The future viability of a vibrant diamond industry unequivocally hangs on the industry’s ability to reignite a natural diamond’s appeal and “purpose” in society. Looking even further out, at current diamond prices, the global portfolio of diamond mines will shrink from over 50 commercial mines today to an estimated 14 by 2040, consequently production in carat volume will fall from 145 million carats to roughly 60 million carats (see Figure 3). In order to maintain what is currently a $90 billion natural diamond jewelry industry, diamond prices would have to more than double and/or jewelry margins at the end-consumer level would have to increase, in part by decreasing diamond content, in order to maintain even a nominal zero growth environment in dollars.